We found no specific mention of hydrocarbon production from the Mt. Simon in the Michigan Basin. However, Catacosinos and others (1991) provided maps showing fields that have produced from Cambrian as well as younger units in the basin. 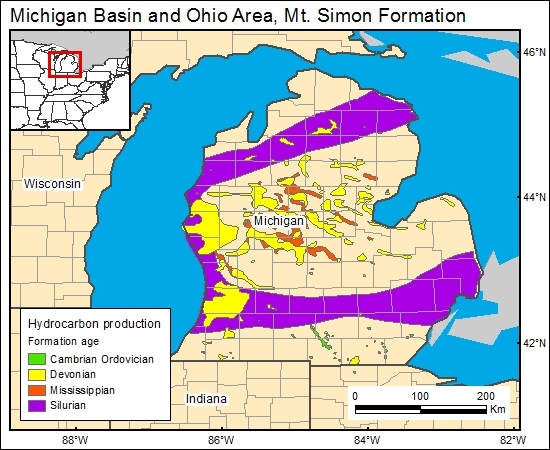 Catacosinos, P. A., Harrison, W. B., III, and Daniels, P. A., Jr., 1991, Structure, stratigraphy, and petroleum geology of the Michigan Basin, Chapter 30, in Leighton, M. W., Kolata D. R., Oltz, D. F., and Eidel, J. J., eds., Interior cratonic basins: American Association of Petroleum Geologists Memoir 51, p. 561-601.